Free Shipping Included! 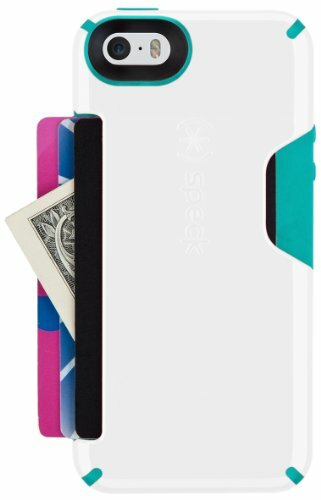 Save 1% on the Speck Products CandyShell Card Case for iPhone 5/5S - White/Caribbean Blue by Speck at All Company Mobiles. MPN: 71079-B859. Hurry! Limited time offer. Offer valid only while supplies last. Leave the wallet or purse at home! The Speck CandyShell Card Case for iPhone 5/5S lets you stash up to three cards in the built-in rubberized slot. Leave the wallet or purse at home! The Speck CandyShell Card Case for iPhone 5/5S lets you stash up to three cards in the built-in rubberized slot. Slide in your cards to store them securely, and pop them out with the handy thumb release when you need them. The glossy hard outer shell of this iPhone 5/iPhone 5S card case protects against impacts, yet still slips easily in and out of your pockets. The rubbery lining absorbs shock and also extends to the screen’s edges, which protects your iPhone 5/5S credit card case if it falls screen-first, and gives it no-slip stability when you place it face down.